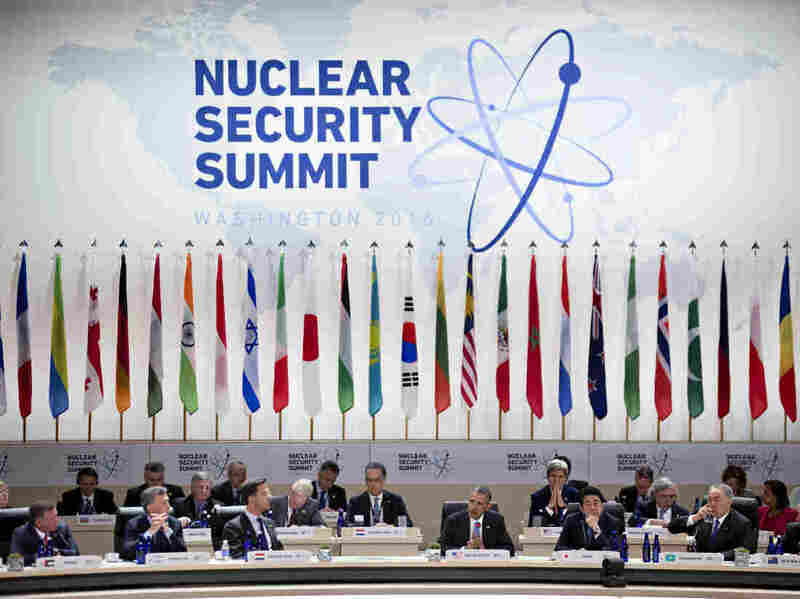 At Nuclear Summit, Many Leaders But No Breakthroughs : Parallels The fourth and final nuclear security summit is underway in Washington this week. But Vladimir Putin isn't there. And North Korea has thumbed its nose at the gathering by firing a cruise missile. President Barack Obama, speaks during the opening plenary of the Nuclear Security Summit on April 1 in Washington, D.C.
More than 50 world leaders are attending a nuclear security summit in Washington this week. But Vladimir Putin is a no-show. And, as if on cue, North Korea fired a ballistic missile on Friday. These biannual nuclear summits, aimed at locking down fissile material worldwide that could be used for doomsday weapons, were proposed by President Obama back in 2009, barely two months into his presidency. "We must insure that terrorists never acquire a nuclear weapon," he declared, calling such a scenario "the most immediate and extreme threat to global security." In that same April 2009 speech, Obama challenged the world's keepers of some 2,000 tons of highly enriched uranium and plutonium to "secure all vulnerable nuclear material around the world within four years." 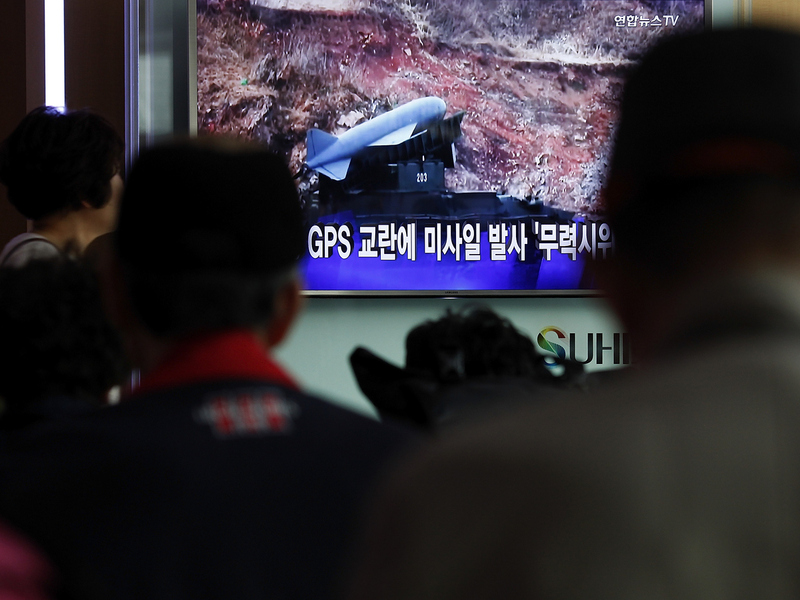 At the Seoul railway station, South Koreans watch a television broadcast reporting North Korea's surface-to-air missile launch on April 1. White House Deputy National Security Advisor Benjamin Rhodes all but declares that goal accomplished, pointing to the achievements of the previous three summits. "Because of these efforts, it is harder than ever before for terrorists or bad actors to acquire nuclear materials," Rhodes told reporters in a conference call prior to this week's summit. "That, of course, makes all of our people more secure." Sharon Squassoni, a non-proliferation expert at the Center for Strategic and International Studies (CSIS), a Washington defense think tank, agrees that a lot of progress has been made in securing the most vulnerable nuclear materials. But the job isn't finished, she says, warning that the political pressure to get it done is waning. "We know what to do," she says. "The question is, do we have enough willpower and money and attention to do it." Whatever does get accomplished at this summit, Russia won't be part of it. Despite his country's full participation in the previous three nuclear summits, Putin is boycotting this gathering. Moscow officials chalk his absence up to what one Kremlin official called "a shortage of mutual cooperation" in planning the meeting. In Washington, Putin's snub of the summit is widely seen as a lost opportunity and payback for sanctions the U.S. imposed on Russia for its actions in Ukraine. Moscow, which holds the world's largest nuclear weapons stockpiles, ended virtually all its nuclear cooperation with the U.S. more than two years ago as part of the political fallout from tensions over Ukraine. "One could argue that without Russia there to weaken some of the [summit's] statements, as it has done in the past, you could probably get more forceful results," says Olga Oliker, a Russia expert at CSIS. "I mean, there's progress that could be made on a number of areas, but there are a lot of areas where Russia's absence is sort of a missing elephant in the room." That absence all but guarantees that no binding across-the-board agreements on nuclear security can be made at the summit. Nuclear-armed North Korea was not invited and has never attended these summits. Iran was not invited, either. A special session is planned to examine the nuclear ambitions of the Islamic State. "Having this many leaders together at once provides us an important opportunity, in the wake of the recent attacks in Brussels and other countries to address how we can enhance our capabilities to work together to confront the threat posed by ISIL," says White House advisor Rhodes. No more nuclear security summits are planned after this one. "The real question for this nuclear security summit is, will the leaders take enough action to put us on a path where nuclear security will continue to get better," says nuclear proliferation researcher Matthew Bunn of Harvard's Belfer Center for Science and International Affairs. "Once we're not meeting at the summit anymore, will attention turn elsewhere and progress stall and eventually erode, leading to a higher danger of nuclear terrorism? " Much will depend, Bunn says, on the next president.